Graduate student Nathan Grant, sponge expert Dr. Sally Leys, and others from the University of Alberta have conducted the first investigations on how reef-forming glass sponges respond to sediment in natural conditions. The results of the study raise concerning questions about the protection of these unique animals. Since their discovery in 1987, glass sponge reefs have been thought of as the delicate treasure of BC’s coast. Glass sponge reefs were thought to have gone extinct 40 million years ago, and their discovery has been likened to finding a herd of dinosaurs. Glass sponge reefs are only found in BC and Alaska, forming intricate and towering formations deep on the ocean floor. These reefs form oases amidst the otherwise barren seafloor, attracting numerous species of rockfish, prawns, and sharks. Sadly, these vital ecosystems are vulnerable to damage by sedimentation. 26 April, 2018 (Vancouver, BC) – Two new glass sponge reefs have been discovered on BC’s coast, it was announced today. Underwater surveyors Farlyn Campbell and Jody Eriksson uncovered the incredibly rare, ancient glass sponge reefs near Port Hardy when surveying near fish farms. Footage of these reefs collected by Tavish Campbell, Wild First campaign spokesperson, show that while one of these rare ecosystems is flourishing, the other, located directly below an open net-pen salmon farm, has been smothered by waste and is entirely dead. Photo of newly discovered reef by Tavish Campbell Photography. 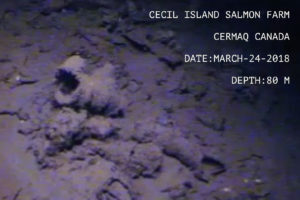 Photo of newly discovered reef destroyed by waste from a salmon farm. Photo by Tavish Campbell Photography. The Canadian Parks and Wilderness Society (CPAWS) has been working to protect glass sponge reefs in BC for decades and calls this discovery a wakeup call. Glass sponge reefs were thought to have gone extinct 40 million years ago, until living glass sponge reefs were discovered in Hecate Strait, BC in 1987. 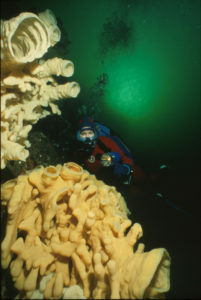 Glass sponge reefs are found only in BC and Alaska, making them globally unique to this coast. The reefs provide important habitat for a wide variety of marine species, including spot prawns, rockfish, and sharks, but are fragile and susceptible to damage. Despite the importance of glass sponge reefs to BC’s ocean health, most glass sponge reefs lack any permanent, legislated protection. 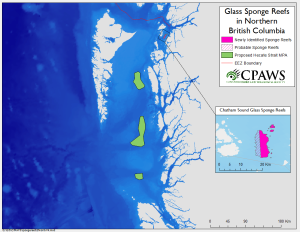 The two newly discovered glass sponge reefs, located in a remote area in the Broughton Archipelago, join other glass sponge reefs in BC missing effective protection. After more than two decades of campaigning by CPAWS, the glass sponge reefs of Hecate Strait and Queen Charlotte Sound were designated as a marine protected area (MPA) in early 2017. This MPA places restrictions on harmful activities protecting the reefs from direct damage by fishing gear and smothering due to sedimentation. Several other glass sponge reefs of varying sizes have been discovered in BC but have not received protection. Given the fragile nature of these reefs and the current human activities in the area, Jameson believes that it is lucky that even one of these reefs is still alive. “With such limited restrictions on harmful activities along the coast, the discovery could just have easily been of two destroyed reefs,” notes Jameson. To find out more about BC’s glass sponge reefs, the threats they face, and the work CPAWS is doing to protect them, visit www.glassspongereefs.com. Ottawa, Ont. – The holidays are looking brighter this year with the announcement that British Columbia’s Hecate Strait and Queen Charlotte Sound glass sponge reefs are being added to Canada’s tentative list for World Heritage Sites. The nomination to the list was made by the Central Coast First Nations, specifically by the Chiefs of the Heiltsuk, Kitasoo/Xai’Xais, Wuikinuxv and Nuxalk Nations, and supported by Fisheries and Oceans Canada and CPAWS. The reefs were discovered in 1987 by a team of Canadian scientists surveying the seafloor in Hecate Strait and Queen Charlotte Sound, off BC’s north coast. The reefs are over 9,000 years old, reach the height of an eight-storey building, and cover 1,000 km2 of ocean floor. Since their discovery, a handful of smaller reefs have been found elsewhere in BC and Southern Alaska. However, BC’s Hecate Strait and Queen Charlotte Sound reefs are by far the largest living glass sponge reefs anywhere in the global ocean. German scientist Dr. Manfred Krautter, was the first person to realize the global significance of the discovery of living glass sponge reefs in Hecate Strait and Queen Charlotte Sound. Dr. Krautter had studied fossilized reefs in Europe for many years and likened the discovery of living glass sponge reefs to finding a herd of dinosaurs on land. 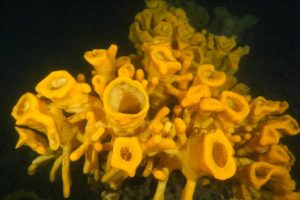 “At first I couldn’t believe it, we thought that glass sponge reefs had gone extinct about 40 million years ago, and then all of a sudden here is this ancient ecosystem alive and well off the coast of Canada, it was really amazing and I knew right away that the reefs should be a World Heritage Site” said Dr. Krautter. 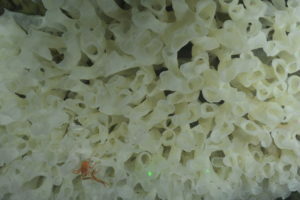 Glass sponge reefs provide important deep-sea habitat for a host of species, from prawns to rockfish and sharks. But the reefs are also tremendously fragile, and not long after their discovery scientists noticed large areas of reef destroyed by bottom trawling, traps, and other harmful fishing activities. “We’re hopeful the World Heritage Committee will recognize the unique value of the glass sponge reefs as the international treasure that they are,” says Jessen. CPAWS is celebrating a new marine protected area for Canada’s ancient and unique glass sponge reefs in BC’s Hecate Strait and Queen Charlotte Sound! CPAWS has been working to protect these reefs for over 16 years. This incredible announcement did not go unnoticed. We were absolutely over-the-moon to see a congratulatory tweet from “Her Deepness”, world-renowned marine biologist Sylvia Earle, and equally excited to see Leonardo DiCaprio share our glass sponge reef video via his social media pages to a global audience of millions of people. See the video below! “We are overjoyed to see these reefs finally get the protection they need as Canada’s newest Marine Protected Area,” said Sabine Jessen, CPAWS’ National Ocean Program Director. “The reefs are an international treasure, they are globally unique, incredibly important, and deserving of strong protection so that they can remain a source of awe and wonder for generations to come,” adds Jessen. “Glass sponges are as fragile as they sound. They have the consistency of a baked meringue or prawn chips, and are very easily damaged,” said Jessen. Heavy fishing gear like bottom trawl nets and prawn traps can crush the delicate reefs, while the sediment plumes kicked up as equipment is dragged along the sea floor can smother and choke the sponges. “Tragically, we think about 50 per cent of the glass sponge reefs have already been destroyed by bottom trawlers and other heavy fishing gear,” adds Jessen. Initially, the proposal for the MPA did not prohibit these harmful activities from happening right next to the reefs, putting the reefs at risk from further damage. After receiving thousands of letters from Canadians, as well as a letter from more than 40 international marine scientists, all demanding better protection of the reefs, the federal government strengthened the protection measures. The MPA will now prohibit all bottom contact fishing activities from occurring within at least 1 kilometre of the reefs until it can be proven they are not harmful, and will implement more stringent measures for the midwater trawl fisheries through fisheries closures. “We are pleased to see that the Government of Canada has taken the necessary steps to improve the protection of the reefs and that the government has taken a much more precautionary approach to the design and management of this MPA. We firmly believe that there will be significant long-term benefits of strongly protecting the reefs that will outweigh the small impacts to the fishing industry,” said Jessen. “As an important nursery habitat for many commercially important species, many fisheries depend on the reefs, so protecting them will ensure the long-term sustainability of these fisheries,” Jessen added. 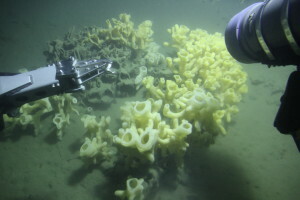 A new 12 kilometre long glass sponge reef has been discovered near Prince Rupert in Chatham Sound making it one of the largest glass sponge reefs discovered in BC making it a very significant discovery and a very important ecosystem. The reef is in the potential pathway of a number of proposed industrial developments so it needs to be protected, and quickly! Proposed Protections for BC’s Glass Sponge Reefs Too Weak! In June 2015, Fisheries and Oceans Canada published the draft regulations for the proposed Hecate Strait and Queen Charlotte Sound MPA for public review. CPAWS, alongside other conservation groups, 40 leading international marine scientists and almost 2000 Canadians say that the proposed regulations are not good enough. Strait of Georgia’s glass sponge reefs protected! Vancouver, BC – 5 June 2015 – Local and national conservation groups are welcoming today’s announcement by the federal government of fishing closures for the Strait of Georgia’s glass sponge reefs – a global treasure found nowhere else in the world.